Kerry and I have opened another store! fh handmade is the online storefront for the Helen Parker Art Studio, a Lafayette, Colorado destination. Partner designers Rachel and Kerry founded Milagro Jewelry and have sold their art and run classes out of the studio now for five years. 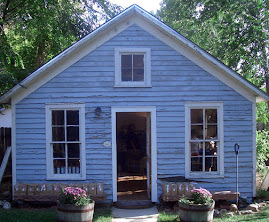 The studio offers fine sterling silver and semi-precious jewelry, a wide assortment of fabric art and everyday fabric items as well as a growing line of mixed media collage. The fh line continues to grow with expanded lines and new art forms. You can see and be the first to own our new creations as well be introduced to up and coming artists in rotating showings. 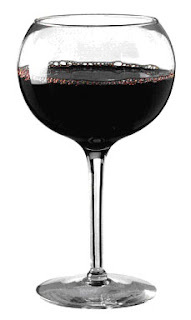 Visit often to see our changing inventory and to catch those one of a kind items before they are gone. fh handmade is the place to go if you want that unique art accessory for yourself or your home. We hope you enjoy! "None of us knows what the next change is going to be, what unexpected opportunity is just around the corner, waiting a few months or a few years to change all the tenor of our lives." Kerry and I are members of a book club. Currently we're reading Well Behaved Women Seldom Make History, by Laurel Thatcher Ulrich. It is a non-fiction, women's studies book, that while interesting, takes me straight back to that basement classroom where I my first women's studies course. Not that it's a bad thing, I loved my college women's studies and women's literature courses. The book makes a good refresher utilizing that oft-used motto as a framework of women in history. Yesterday, I went to the bookstore to pick up the next two books on our list. The February book, Trailerpark, by Russell Banks looks interesting. It is a series of short stories about the lives of people in a New England trailer park. 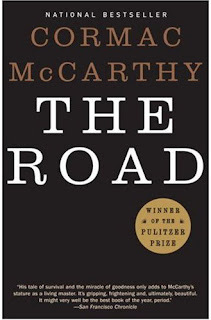 I am looking forward to reading our March book, as well, The Road, by Cormac McCarthy. McCarthy won the 2007 Pulitzer Prize for literature for this book. I had to search a bit around the book store to find this one, as it had been moved off its regular spot on the literature/fiction shelves to create a display that capitalized on the books' upcoming movie release. Purposefully, I selected a copy of The Road that did not look like the movie poster. I generally appreciate books as books, not movies. After I bought my book, I noticed a large gold seal proclaiming "Now A Major Motion Picture." No worries about that, I would just peel it off. Which I did. 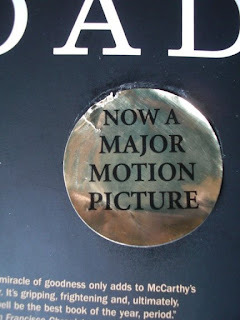 Underneath the Motion Picture sticker were the remnants of the Winner of the Pulitzer Prize sticker. How sad. What does it say that book sellers would peel off the sticker proclaiming the book had won one of the top prizes in literature and replace it with one that advertised a not yet released movie? What does it say about us? Sad, but true, movies sell more books. We hope you all had a wonderful holiday season. We've taken a little blog holiday. We have been busy with the hustle and the bustle of the season. And now, we are ready for the New Year! Are you? The wind has been horrible here. It keeps everyone up at night. 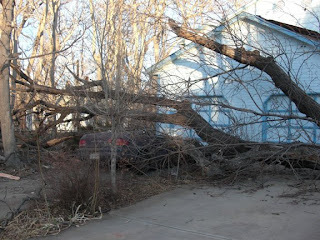 A few days ago we had hurricane force winds all along the front range area. We had gusts up to 90 miles an hour. It was crazy! 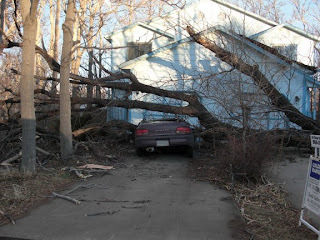 Can you find the car in these pictures? And, no, it was not a convertible. 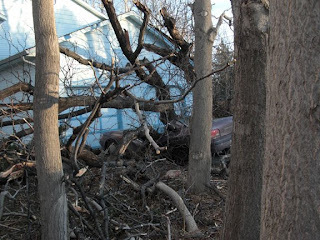 The tree sliced the car in half. So, we are wishing for calmer winds and a peaceful year.